One of the main reasons that I decided to apply for a job at Southern Illinois University Edwardswville (SIUE) was because of the chance to work with Eugene B. Redmond. 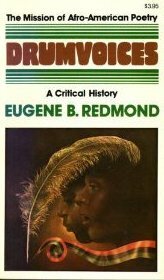 And one of the main reasons that I wanted to work with Professor Redmond was because of his book Drumvoices: The Mission of Afro-American Poetry, A Critical History (1976). (I learned of his collection of over 100,000 photographs of black writers only after meeting him). Working with the author of such a remarkable history of black poetry, I figured, would be enormously beneficial; I envisioned working with Redmond as a kind of apprenticeship in black cultural work. Drumvoices traces the histories of African American poetry from folklore and the spirituals to the then contemporary era of black poetry in the 1970s. At the time of its publication, no other single study had covered so much ground, so many African American authors, and as much poetry as Redmond's work. The book was and remains a remarkable history of Black, American poetry. In the preface, Redmond wrote: "The thesis of Drumvoices is simple: that God's trombones have historically blarred through or soothed the harsh and stark realities of the Afro-American experience; and that the sources (records) of these blarings and soothsayings, locked in cultural safe-deposit boxes of drums and the intricate acoustics of the folk, remain accessible to anyone desiring to tap them." Redmond's work was received favorably by readers, and especially poets, when it appeared in 1976, the same year that Redmond was named Poet Laureate of East St. Louis. Black arts era poets were pleased that one of their comrades had written such a marvelous study. Redmond's authorship of Drumvoices confirmed the idea of poets as essayists and scholars and cultural historians. Among other merits, Redmond's book confirmed the extents to which contemporary African American verse had emerged out of rich artistic and expressive traditions. In other words, Drumvoices solidified understandings of how the new black poetry of the 1960s and 1970s was birthed by extensive, literary and cultural histories. This entry is part of a series--30 Days of Black Arts Poetry.